Crickets that are used as food for other animals are known as feeder crickets. They can be purchased alive or pre-killed and dried. Live crickets have a lot of protein, vitamins, and other nutrients essential for a pet’s well being. They are an excellent food for geckos, bearded dragons and other reptiles. Crickets are also good for small mammals, birds, and frogs. Larger crickets can even be used as bait for fishing. Feeder crickets are offered in a variety of ages ranging from adults to pin-heads. Full grown adult crickets are about an inch and a quarter long and are perfect for larger reptiles, small mammals, and fishing. 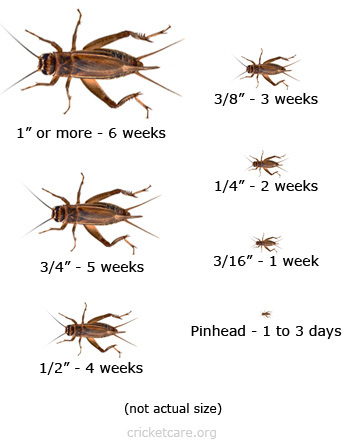 Tiny pin-head crickets are the size of small ants and are good for frogs, toads, fish, and young reptiles. Dried crickets have been freeze dried or slowly dried in an oven. Although many animals often prefer live insects, dried crickets can be stored as an emergency backup or used when live insects aren’t available. They are easy to store, require no maintenance, and retain many of their nutrients. When using dried crickets, make sure they have been gut-loaded before drying. Gut-loading is when an insect is fed a nutrient rich diet. These nutrients are passed to an animal when it eats the insect.